I hear people were using the phrase Chinese New Year a lot. It even gets abbreviated to CNY sometimes. Recently, though, it dawned on me that this isn't actually the best terminology for this occasion, and it surprised me even more that in Canada, where people try to be politically correct to a fault, that no one has as yet taken up this cause. The more correct phrase is actually Lunar New Year. It's already known that Chinese New Year is based on the lunar calendar, but thing is that many other Asian countries celebrate this event as well, meaning that it could be just as correct to call it Vietnamese New Year or even Singaporean New year, for that matter! To incorporate all the countries that celebrate it, Lunar New Year is definitely a better option. I assume the Chinese New Year name sticks because there are just so many Chinese, population-wise, that maybe that's just what you'll end up hearing more often anyway. I also wonder if that same cause holds true for Ukrainian Christmas in Canada. There are a lot of Ukrainians here, especially in the prairies, and they also celebrate Christmas according to a different calendar. But it turns out that it's not just the Ukrainians that do it. Any group of Orthodox believers or practitioners celebrate Christmas at the same time, and non-Ukrainians actually refer to it as Orthodox Christmas. This holiday is celebrated by many other Eastern Europeans (as that's where you tend to find more Orthodox churches), but it's also celebrated by the Coptic Egyptians, who follow a lot of Orthodox practice. I guess if no one's offended by the less generic terms, I'm not going to get too upset about it either. It's just that I do find it a little odd that in Canada, we're not using the most politically correct terms for these holidays. I have a passion for dancing, languages generally (learning them and knowing things about them), and culinary delights, among many other things. To loan or to lend? Exceptional craftsmanship. Exquisite beauty. 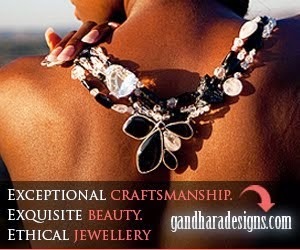 Ethical jewellery. A serious grammar discussion today! Are you begging the question correctly?